This face lift surgery uses special medical thread that has 2-3 times more wrapping than regular thread. It is inserted into the skin layer and pulls the wrinkles tight, resulting in a semi-permanent effect. In addition to skin regeneration from collagen synthesis, cosmetic surgery facelift helps the skin tone improve and provide anti-aging effects. This Facelift provides anti-aging effects and a v line facelift. Fine thread lift surgery uses a PDO substance dissolvable thread approved by the FDA to insert into the skin layer and pull toward the desired area. This facelift will regenerate skin cells around the area and improve wrinkles, skin elasticity, tone, and has the effect of a slimmer v-line chin. Insertion of butterfly shaped thread-ends with a needle, into dermis of the skin to regenerate skin cells and give a lift effect. Inserted thread slowly melts inside of skin within 6 months; it is one of the most popular procedures these days, for it avoids side effects that may occur after thread lift, such as having a bumpy skin surface or feeling of irritation. Endotine, an implant used for pulling wrinkles, is fixated within the skin layer and tightened up to the desired location, which smoothens out wrinkles, increases skin elasticity, and provides anti- aging effects. This procedure is especially effective for thick and deep wrinkles, absorbs within the body after 6 months, creating a more natural and semi-permanent face lifting effect, which is popular among middle aged patients. Mesh face lift includes inserting mesh, an elastic, net-like material, and pulling to remove wrinkles from drooping skin. The inserted mesh maintains elasticity and gently follows the muscle movement which creates a natural anti-aging effect. This face lift procedure removes SMAS tissue within the skin, which has sagged due to aging. And it has the effect of pulling the skin upwards for a tighter face. The skin is not simply pulled but the drooping muscle tissue is removed so that a permanent anti-aging effect is achieved through a simple facelift. Laser lift, a procedure using safety approved lasers, is a facelift procedure that creates maximum effect without incision. It also has a natural facelift effect along with improvement of drooping skin and elasticity. 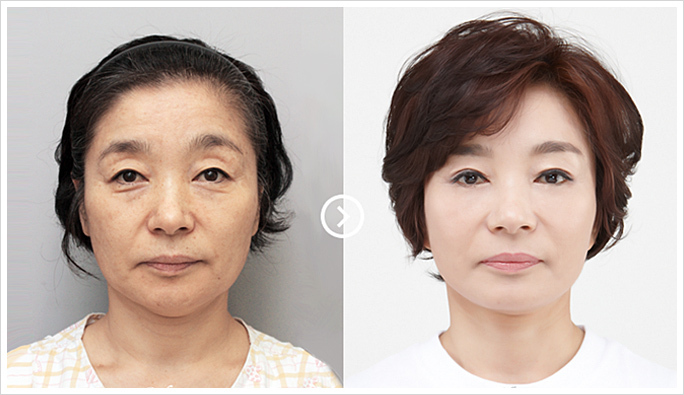 This ‘mini facelift’ is rising in popularity as the procedure for having a younger face. Accusculpt laser is used to dissolve fat tissue stored in the face for a slimmer facial line. Using a wavelength of 1,444nm, the micro laser beams towards the saggy and wrinkly skin area, not only to dissolve fat tissue stored in the face but also to stimulate collagen production for a tightening anti aging effect.